Making homemade applesauce has been a loved tradition passed down in Noel's family for generations. As much as the end result is the most heavenly applesauce you've ever tasted, the sweetest part is sharing those moments with the ones you love. Though I have made applesauce in years past, a few days ago was the first time Cohen and I washed, cut, cooked and processed the apples together. Washing the apples was by far his favorite part. I filled both sinks with water and loaded two bags worth of apples. In the time it took me to wash, cut and fill pots of apples, Cohen had fully drenched the front side of his body. He realized that not only was it fun to move the apples around really fast, but if you pick them up high and drop them, they make quite a good splash. 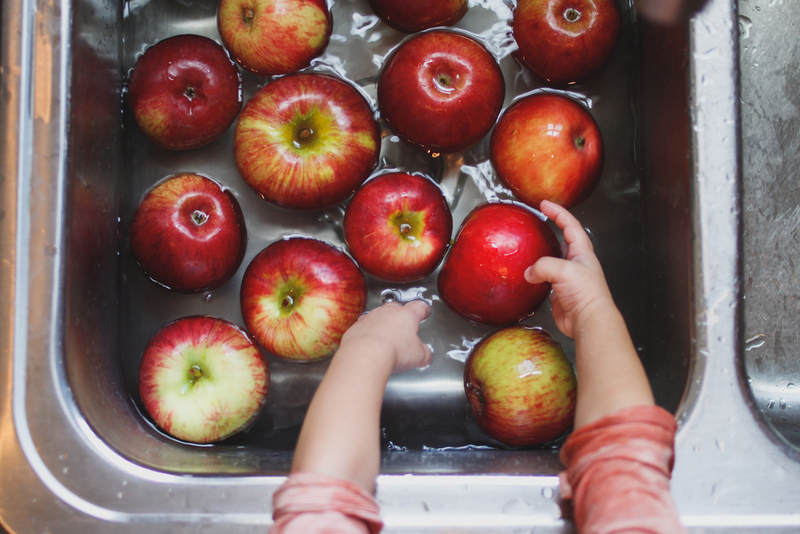 Even though in my head I knew he was most likely bruising most of them, I couldn't help but smile as I watched him giggle and squeal with excitement over how much fun washing apples could be. To him, he was being the most helpful assistant and this mama would definitely have to agree. Because, what could be more helpful than having a happy little boy in the kitchen with me all day making applesauce? For weeks I had been waiting in anticipation to make this with him, not only because he is a applesauce devourer but because I know how comforting traditions can be. Even as an adult, I tend to look forward to certain places, events or meals because they flood such great memories back into my head of time spent with the ones I love. The tradition of making this applesauce has now taken place in our family and all the fun memories that come along with it.